Describes Beat structure, basic mechanics, and a list of keywords for reference. Bring the Opponent to 0 Life. Have the most Life at the end of the 15th Beat. In the event that the game ends due to timeout and both players have tied in Life, the winner is the player whose attack activated second, or the Reactive Player. To interact with the game, both players have a hand with two types of cards in them: 6 Styles, and 7 Bases. Players will combine a Style with a Base in order to build their attack for the current turn. Effectively, this allows players to combine the numbers on both cards, along with all of the text on both cards. There are two discard piles, named Discard 1 and Discard 2. After the end of the turn, the cards that you played in your attack are placed into Discard 1. All cards previously in Discard 1 move into Discard 2, and all cards that were in Discard 2 return to your hand. In essence, this means that your attacks have a two turn cooldown period where neither card in that attack may be used again. All players, regardless of the character played, have access to 1 Style (Switch) and 6 Bases (Grasp, Drive, Strike, Dodge, Shot, Burst.) The character chosen will give you another 5 Styles and 1 Base unique to them. 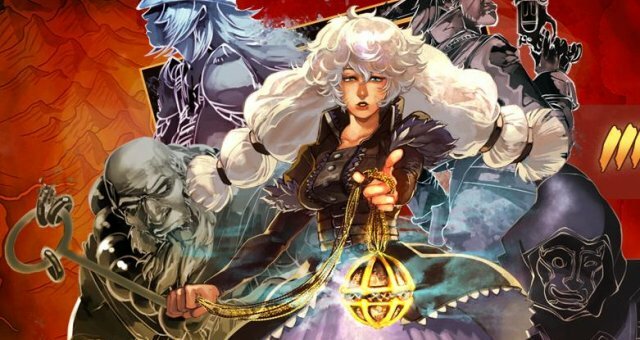 Each character will also have a unique power that they can use to manipulate the game state, called their Unique Ability. Among the different actions a character can take with their attacks are movement. Movement has very distinct rules that help in determining where a character can position themselves and their opponents. Among the most important is that movement is typically mandatory. 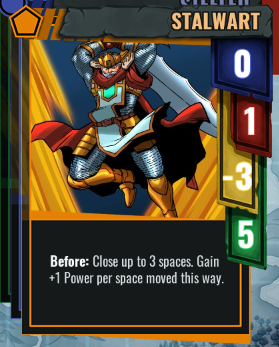 If a card says "Move 1 or 2 spaces," then you must move at least 1 space, and no more than 2. If you are unable to move with an effect, then all of the movement on that effect is ignored. This is notable in circumstances such as using Cadenza's Rocket Press, where it must be able to move exactly 2 or more spaces towards its opponent. If there is only one space between it and the edge of the board then Rocket Press' movement fails. On the other hand, other attacks that say "Move up to X" allow any number between 0 and X. If you use forced movement effects and effect cancellation properly, you can force your opponent into disadvantageous situations. There's a few keywords involved with movement that determine the direction of movement. 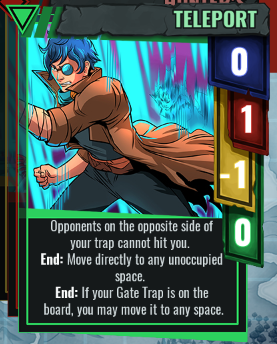 Advance, as seen on the Drive base, allows a character to move towards their opponent. If a character would move onto the same space as their opponent, they instead move into the space behind their opponent. 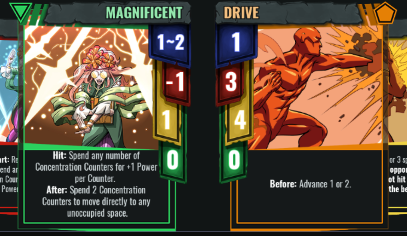 Advance effects continue moving in the same direction that they started in, which means an "Advance 3" effect can potentially carry you up to 3 spaces behind your opponent's position. Close, as seen on some character effects, works the same way as Advance. The only difference between the two is that Close does not allow you to move past your opponent. Any unspent movement in a Close effect after becoming adjacent to the opponent is cancelled. If an effect would prevent you from becoming adjacent to the opponent, then you simply advance as close as normally possible. 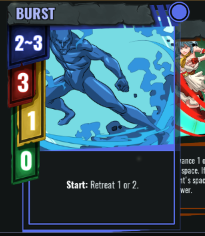 Retreat, as seen on the Burst base, has your character move directly away from the opponent, acting as the opposite of an Advance. Move, as seen on the Dodge base, effectively reads as "Advance OR Retreat this many spaces." Choose a direction to move in, then move however many spaces you need to. 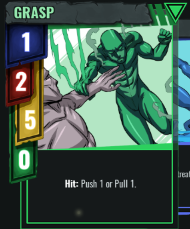 Push, as seen on some character effects, is a lot like making your opponent retreat. You move the opponent that many spaces away from you. Pull acts as the opposite of a Push, moving the opponent towards you. 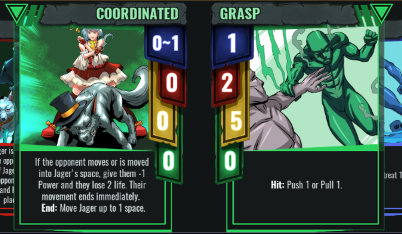 Effects that say "Move the opponent," as seen on Grasp, act as "Push OR Pull this many spaces," much like a Move would affect you. There are some odd movement effects such as Move Anywhere and Place. When an effect tells you to "Move Anywhere," you must move from your current space to any legal space on the board that isn't already occupied by a character. When an effect says something to the effect of "Place your marker," you put your character's marker on the board. Markers interact with a character's Unique Ability to provide them with various bonuses. Most markers start on the board, but characters like Khadath have to use a Place effect to position their marker. Markers can generally be placed underneath characters and other markers. Effects that say "Move your marker anywhere," act a lot like a "Move Anywhere," but includes all spaces on the board, including the marker's own space. When you begin playing BattleCON, what will likely be the most confusing part will be figuring out what does what, and in what order. 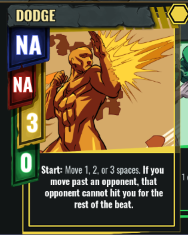 A turn in BattleCON is called a Beat, and there will be a maximum of 15 Beats in a game. Beats occur semi-simultaneously, meaning that both players will make decisions for the current Beat's attacks at the same time, but they will activate their attacks in a specific order. Before the game even begins, players have 80 seconds to set up their starting hands. The first prompt the game asks for is your Discard 1. Pick two cards that you won't care about not having for two turns (Switch and Grasp are usually strong choices.) After that, pick two more cards for Discard 2, which you won't have in your hand until the second Beat (A niche style and Strike usually go well here.) Finally, choose one of the two Finisher options available for your character. Typically, one Finisher acts as an easy recovery mechanism for your character, while the other acts as an all-or-nothing attack. After both players have chosen their starting setup, the game officially begins its standard turn order. Sometimes after locking in, both characters will swap positions on the board. Whichever character is on the left-hand side of the board will be denoted as the Active Player, which is important during the Ante step. For the first two beats of the game, players will have 80 seconds to decide on their starting attacks. Afterwards, each beat allows 60 seconds to pick your attack pair. You can cycle through the roulettes to choose your Style and Base, and you can click on the opponent's portrait to look at their available options. After you lock in your choice (or after the timer runs out and automatically locks in your choice), move on to the next step. Starting with the previous Beat's active player (or the player on the left side of the board, in the case of the first Beat), players take turns either passing or anteing. Once both players pass, we move on to the next step. Players typically make antes using Tokens. All characters share the same three Force Overload Tokens, and many others either come with their own unique Tokens or give their opponents Tokens to work with. A singular instance of a Token may be anted once per Beat, and apart from Force Overloads, these Tokens are discarded until refreshed by a character's abilities. Characters that possess multiple copies of a single Token may ante as many copies of that Token as they wish to during a single ante step. Depending on your opponent's presumed attack and antes, you may wish to ante only one at a time, or perhaps multiple at once to bait your opponent into making certain antes. Both players reveal their attacks to each other. Any Reveal text on the cards shown immediately activate. Then, we determine the Active Player. While this likely won't make too much sense until the Attack Pair Overview, the most basic way to explain Active Player at the moment is that the player whose attack pair has the highest Priority value will become Active, and their opponent will become Reactive. This means the faster player takes all of their necessary actions during each step first. This was seen during the Ante step, and will be seen in every following step in the turn order. In the event that both players have a matching Priority score, their attacks Clash. When this occurs, both players temporarily remove their Bases from play and must choose a new Base to play with their chosen Style. In the event that players Clash with all of their bases, the Beat immediately skips to the final step, and the last-played Base and Style are discarded. In either case, move to the next step. Starting with the Active Player, both players perform all Start effects on their attacks. These typically allow players to close in or evade opponent's attacks. Once both players have finished, move on to the next step. During this step, the Active Player attempts to deal damage. This step, and the next step, are broken down into sub-steps. The Active Player performs all Before effects on their attack. These effects usually involve ways to close gaps or add range onto an attack. The Active Player checks how many spaces away they are from their opponent, with adjacent spaces starting at 1. 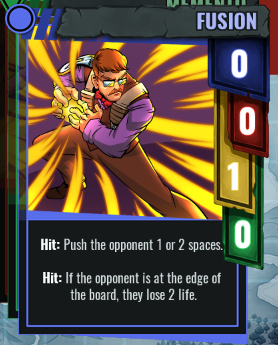 If the opponent somehow shares the same space as the Active Player (some card effects measure from spaces other than your character's position), then they are 0 spaces away. For instance, sometimes you want your dog to punch people. Next, determine if the opponent is within the Active Player's attack's Range. Range is indicated by a minimum and maximum Range value, which determines the minimum and maximum distance your opponent can be from you for your attack to land. If your opponent's distance from you is within the listed Range, your attack Hits. Or you've got a weird Range listed on your attack that dictates when you hit. The Active Player performs all Hit effects on their attack if it hit. If they did, go to 5c. Otherwise, skip to 5d. If the Active Player Hit, they deal Damage equal to their Attack's Power, minus any Soak on the opponent's Attack Pair. This Damage is subtracted from the opponent's Life total. If this drops their Life to 0, they lose the match. Otherwise, if the opponent lost any amount of Life due to Damage, the Active Player performs all Damage effects on their Attack Pair. If the opponent lost Life due to Damage, they may become Stunned. If the opponent has no Stun Guard, they are Stunned. If the Damage they took is greater than the Stun Guard of their Attack Pair, they are Stunned. Otherwise, they are not Stunned. Especially not if they're Stun Immune. The Active Player performs all After effects on their attack. These usually aid in repositioning. If the Reactive Player was Stunned, skip this step; their attack was stunned out and negated. Otherwise, they follow the same series of actions as in Step 5. Note that the Active Player can still be stunned by the Reactive Player's attack. In most cases, this doesn't matter, but some characters are sensitive to becoming Stunned. Starting with the Active Player, both players perform their End of Beat effects, regardless of whether or not they were Stunned during the Beat; Stun only prevents Attack Activation. Use your End of Beat effects wisely so that you can capitalize on the positioning that the Beat's attacks left you and your opponent with. As the last thing each player does, they each gain 1 Force if they are at 8 or greater Life, or 2 Force at 7 or fewer Life. They then place their Attack Pair into Discard 1, move Discard 1 into Discard 2, and move Discard 2 into their respective hands. Each offers their own advantage that the opponent can counter with their own ante. All three can be active at once, but no more than one of each. And if you ante this, you can bet that your opponent is going to counter-ante it. Finishers become active when your Force is equal to your Life. Playing a Finisher costs as much Force as Life, and therefore will not appear as an option in your hand until that point. When you play the Finisher, it plays alone; it is used as the only card, and any effects that target Attack Pairs do not affect it. After the Finisher is played, your Discards do not move, and your Finisher is removed from the game. After this step is over, return to step 1 and begin the next Beat. Your main source of interaction with the game is going to be with your Attack Pairs. These are one style and one base, combined with all of their numbers and effects. Every Attack Pair will have four major stats listed. Range, as listed by the blue value. Your attacks Hit at the Range listed when activated. Power, as listed by the red value. Your attacks deal Damage equal to this if they Hit. 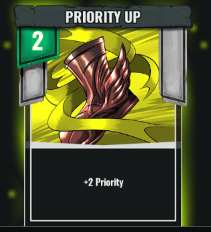 Priority, as listed by the yellow value. Your attack activates first if your Priority is higher. Stun Guard, as listed by the green value. You can still react to your opponent's attack if the Damage you take is not greater than this value. All of the stats on your Style add to the stats on your Base to make up its total stats. If there is a single Range listed on both your Style and your Base, then the total Range of the attack is the sum of the two numbers. If there is a single Range on one card and a minimum and maximum listed on the other, then you add the single value to the minimum and maximum values. Otherwise, you add together the two minimum values and two maximum values to create your total Range. 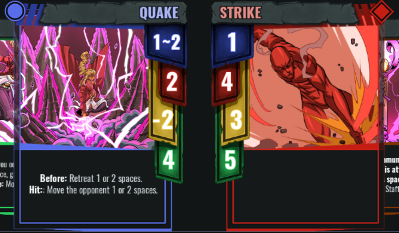 As you can see, Kimbhe's Quake Strike, if you add together all the values, will have a Range of 2~3, a Power of 6, a Priority of 1, and a Stun Guard of 9. You also add all of the attack effects on both cards to your total attack. In some cases, you can create some interesting nested reactions. As you can see here, we have an attack that has two Hit effects. 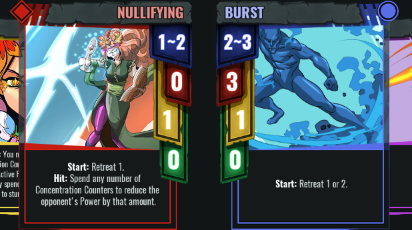 When you have two effects taking place during the same step of the turn order, you may choose the order that they trigger in. 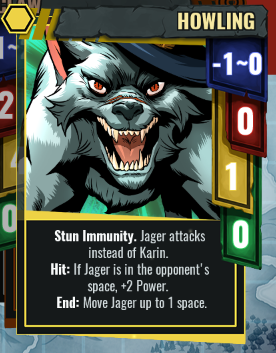 In this case, if the Jager marker is adjacent to your opponent, you can spend Claw's Hit effect first to move Jager into their space, and then immediately spend Feral's Hit effect to stun your opponent. 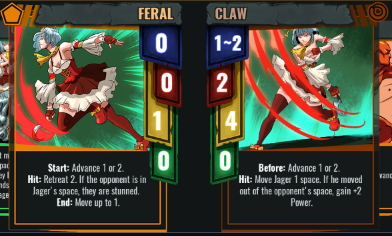 Likewise, if the Jager marker is in the opponent's space, you can trigger Feral's Hit effect first to Stun, and then trigger Claw's Hit effect to gain +2 Power. If there is text on your Attack Pair that has no associated turn order trigger on it, then it is considered a Passive Effect. Passives are always active for as long as the Attack Pair is in play. With the right positioning, you could shove an opponent out of position with Coordinated Grasp and force them to either take more damage from you or deal less to you. The important part here is that while Coordinated is a Passive, Grasp is a Hit. Since Hit comes before Damage, it's possible to drag your opponent out of the +2 Power zone into relative safety. If you added your stats correctly, you should have a Range 2~3, 2 Power, 5 Priority, 0 Stun Guard attack. Now, what Ranges does it actually hit? If you take a look at Drive, you'll notice its Before: Advance 2. Knowing that Advance can move you past an opponent, what ranges can you start your attack's activation from in order to hit? If you mathed it out correctly, you'll be able to hit from range 1, 3, 4, and 5. If you start your attack adjacent to your opponent, you'll be able to Advance 2, putting you at Range 2, and therefore within the 2~3 Range of the attack. Likewise, you only need to Advance 1 from 3 or 4 spaces away, and Advance 2 from 5 spaces. If you're already 2 spaces away, the forced Advance on Drive forces you to move adjacent to the opponent, preventing you from landing the hit. Adding your Advances and subtracting your Retreats from your Attack Pair's Range allows you to hit from anywhere with the right tools. Power adds and subtracts easily from itself. 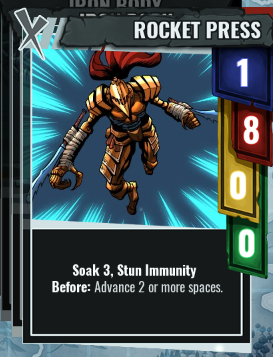 If your aim is to stun your opponent, you'll need a Power that can beat their combined Stun Guard + Soak. 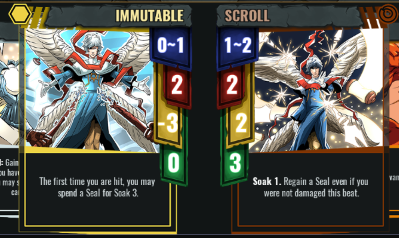 If an Attack Pair has two different Soak values listed, you'll add the two together to give your total Soak value. Occasionally, you should just give up on stunning people. Or damaging them. Priority has the least outside influence on it. For the most part, Priority is merely the Style's Priority plus the Base's Priority, plus any Reveal effects that would trigger. 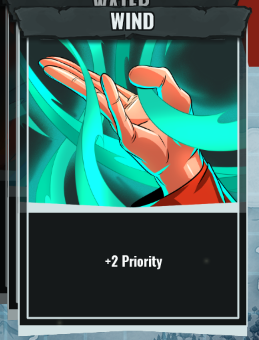 Depending on your character and playstyle, Priority can either be the most important or least important stat to keep on your mind. Fast attacks typically have little to no Stun Guard on them. If you're aiming to stun out an opponent's fast attack, you'll obviously need an even faster attack. And, of course, there are many fast attacks that can instantly Stun an opponent, regardless of their Stun Guard value, or attacks that can move far out of range as an After or Hit effect. Even more important than knowing whose attack will be faster is the Clash. A Clash triggers when both players have an identical Priority. They'll need to switch out their Bases in a limited amount of time, which can end up leading to Clash after Clash, depending on the level of luck and prediction involved. If players can Clash all of the bases out of their hand, the Beat immediately skips to Recycle. An intentional Clash, often against predictable Attack Pairs or Dodges, is referred to unofficially in BattleCON parlance as a Parry. Avoiding becoming susceptible to a Parry, or intentionally Parrying otherwise punishing Attack Pairs, is an acquired skill that leads to mastery of the game. Of course, while a faster Priority means that your attack will activate first, Start of Beat effects occur before any attacks activate. Be careful of your opponent creating or closing huge gaps through Start of Beat effects, or your attacks will never hit when you need them to. Possibly the most important skill in the game is recognizing what Bases you and your opponent have available to you. With every character having access to the same six Bases, you can predict a lot of your opponent's effective actions. Each Base does certain specific things very well, but often requires a Style to compensate for its weaknesses. Grasp: The fast, weak Base. It only hits Range 1 on its own, so it needs a range boost, and preferably a power boost or some way to prevent your opponent from hitting you. 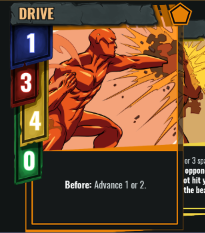 Drive: The fast, ranged Base. With its Advance, you can hit anywhere from Range 1 to 3 with it on its own. Probably the most-used Base in the game, just because it's effective with Power boosts, Range boosts, and Priority boosts. Strike: The slower, powerful Base. Has a load of Stun Guard and Power, lacks basically everything else an attack needs. Works wonders with Range boosts and Before: Advances. Shot: The slow, ranged Base. Hits a huge swathe of the board, but is beat by most attacks. Its low Stun Guard needs a buff in order to make it effective against more attacks. Probably your main source of attack, if Drive is down. Burst: The slow, evasive Base. Note its odd range of 2~3 and its Start of Beat retreat of 1 or 2. If you use Retreat 1, its range effectively becomes 1~2. With Retreat 2, it only hits opponents that were adjacent to you at the start of the Beat. It's also slower than basically every other attack, so it needs a lot of stats to compensate for it. Dodge: The mobile, evasive Base. Dodge is super powerful. It lets you reposition yourself almost anywhere on the board, and it even avoids attacks that can hit the whole board if you can advance past your opponent with it. Its main weakness is that it doesn't actually do any damage, so the Styles it gets paired with are often predictable, making it easy to be Parried by an astute opponent. We often talk about a Base Pentagon when discussing basic BattleCON strategy. That is, each Base, with no modifications to it, beats exactly two other Bases, and loses to exactly two other Bases, excluding Dodge. For instance, Grasp can push out Strike and stun Drive, while Burst can be caught by the Before Advance on Drive and the range of Shot. In reality, the Base Pentagon is not something worth remembering, simply because Styles are meant to muddy the waters. However, knowing what I call the Fundamentals of Bases is still likely the most important skill in BattleCON. The Fundamentals rely on two theories: Style bonuses and Cardlock. The Style bonus theory treats the Base as the main part of the attack, while the Style merely acts as a modifier to that Base. Cardlock theory refers to when a player's available offensive and defensive options are limited because their most suitable cards are currently discarded, usually their Shot and Drive. Used up all of your advances and range? We might have some problems. Looking at the Bases, each now has different strengths and weaknesses based on what your opponent has available and what you can pair them with. Grasp is strong against other fast attacks, and can often catch a Drive off-guard. It is weak against Shot and anyone that can muster enough Stun Guard and Range to stave off its damage and push. Use it against characters who have limited Style ranges, or when you can create a huge gap with your Style. Drive is strong against most attacks, except for high Power, high guard attacks. Boosting its Priority means beating other Drives and Grasps, while boosting its Power allows for breaking low Stun Guard values. The main reason to be using Drive is to help close the gaps that are often created by Burst and Dodge. Strike, if at a close enough range, will absolutely punish Drive plays, and is often capable of punching through other plays if given a Style with good Range. Strikes are rarely beaten, merely avoided, but close-ranged characters can still lose out versus Grasp and Burst plays. Shot can be given a Force Overload Ante for extra Stun Guard, bringing it to a respectible 4 SG. Most character attacks swing at 3 or 4 Power, though many faster ones swing at 2, and deadly payout hits can exceed 7 Power altogether. How you use Shot is often dependent on your opponent's options, but it can catch out Burst plays altogether. The primary difficulty of using Shot is that, at longer ranges, it becomes predictable and can be Clashed out of the Attack Pair without much effort. Burst loses to everything. If it has decent Range, it beats Burst. But, if your opponent is incapable of matching the distance created by Burst, it becomes an exceedingly safe move. Burst's slow Start of Beat movement often means that characters that are reliant on their Start of Beat: Advance effects to close distance will first move forward, and then be evaded by the Burst's Retreat. If your opponent's Drive and Shot are discarded, very few attacks will be able to catch the Burst. The goal here is that, once you've practiced the Fundamentals, you'll be able to play relatively effectively against anyone. You'll need one more theory to help you out here, though: Optimal Range theory. Front-line characters typically have 0~1 as their best Style bonus. Mid-range characters have between 0~1 and 0~3 effective Range on a majority of their Styles. Ranged characters have what are often wide and varied amounts of Range on their Styles. Some attacks will miss Range 1 or 2 entirely. Each character, due to their specific needs, will prefer to occupy different spaces on the board. Front-liners enjoy the center, since Drive and Shot will be able to hit every space. Ranged characters try to stick to corners to provide impetus for the opponent to attempt to close in on them. Mid-rangers get the best of both worlds and prefer to keep anywhere that the majority of their Bases are useful for delivering damage and offer good positioning for the next Beat. Occasionally, you'll find characters who just hit every range fairly well, due to either absurdly high ranges on their attacks or having markers on the board that provide extra range coverage. 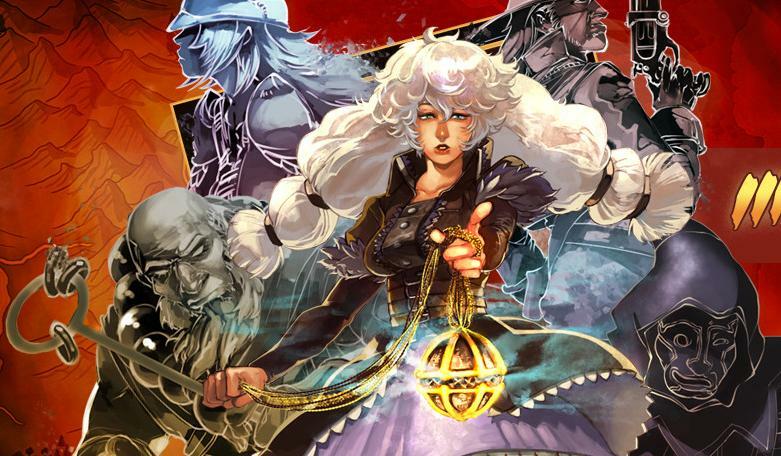 In these cases, such as in playing Khadath or Karin, you want to abuse the opponent's worst ranges to your advantage. Hikaru and Luc are Front-liners. Their Start of Beat: Advances hate the opponent's Bursts, and hitting far ranges often requires a resource expenditure. Kimbhe and Mikhail are Mid-rangers. All of Kimbhe's styles, and most of Mikhail's, provide them with an effective Range 0~1 or 0~2. Rukyuk and Alexian are Ranged. Rukyuk has troubles targeting Range 1, while Alexian gains more Soak and Power based on how far away he is from his opponent. All of that armor and a big old sword, and the guy is secretly just a very muscular sniper rifle. 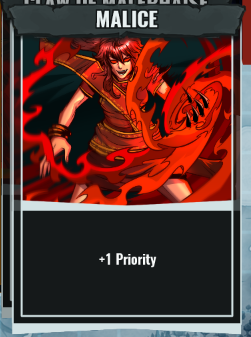 Active Player: The player with higher Priority during Reveal. Once the Active Player is determined, it no longer changes during the Beat, regardless of any changes in Priority thereafter. Advance: Movement towards an opponent. Can pass over and opponent and continue in the same direction. After: The last step of Attack Activation, after Hit and Damage. Ante: The step after choosing your Attack Pair. Players may spend tokens and Force to boost their attacks. Attack Activation: Takes place after Start of Beat effects finish. An activation consists of performing Before effects, checking Range to see if a Hit is scored, performing Hit and Damage effects if necessary, and then performing After effects. The entire activation is negated if the character is stunned before it occurs. Attack Pair: A Style plus a Base. Attack Source: A modifier to an Attack Pair. Range is measured from a place on the board other than the character, usually a marker, counting the marker's space as Range 0. Base: The right-hand card of an attack, becomes modified by the Style. Beat: A single turn, out of 15 The first two beats have 80 seconds of decisions, the remaining beats allow 60 seconds. Before: The first part of an Attack Activation, before determining if an attack hits. Bonus: A modifier to Power, Range, or Priority. These are represented by text like "+2 Power." Some effects can negate bonuses entirely. 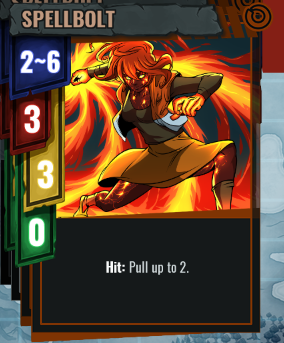 Card: Can refer to a Style, a Base, the Finisher, or a character's unique tools in their kit. Clash: Occurs immediately after Reveal if both players have matching priorities. Their Styles stay in play, while they swap out for new Bases. Used Bases return to hand after a Clash has been fully resolved. If all Bases are used up by a Clash, skip to Recycle step and put the Style and the last-played Base into Discard 1. Close: Movement towards an opponent. Attempts to move as close as possible to the opponent, and then stops. Counter: A resource used by some characters. Counters build up and are either spent automatically as part of the character's UA, or as part of an attack's effect. Damage: A loss to Life that can both Stun and KO an opponent. Discard: Removing counters/tokens/cards from a character's Supply, or placing cards into a Discard Pile. Discard Pile: Discard 1 and Discard 2 constitute the Discard Piles. Discard 1 cards cannot be used for two Beats, while Discard 2 cards cannot be used for one Beat. Dodge: Any effect that states that a character cannot be hit. These oftentimes list specific ranges where a character cannot be hit. The Attack's Source determines when and where an attack will be unable to hit. Eliminated: When a character has been KO'd. Typically occurs the moment Life reaches 0, though some Finishers immediately eliminate either the user or the opponent. End: The last attack effects to take place, after all Attack Activations. Finisher: A singular double-sided card, each side with a different Finisher. Switch can be used to change your Finisher. To use a Finisher, a player needs to be able to spend as much Force as they have Life remaining. Force: A resource available to all characters, spent on Overloads and Finishers. Characters typically gain 1 Force during Recycle, and they gain 1 additional Force whenever Switch is played or when their life is 7 or less. Forced Movement: When an movement effect does not say "up to." Forced movement must be performed as stated. If it cannot be fully performed, then no movement occurs. Gain: Obtain a bonus or resource. Hit: Occurs after all Before effects during Attack Activation. To hit, the distance from the attacker to the opponent needs to be within the attack's Range. Then, Hit effects activate. Ignore Pushes and Pulls: Cannot be moved by opponents while this effect is active. 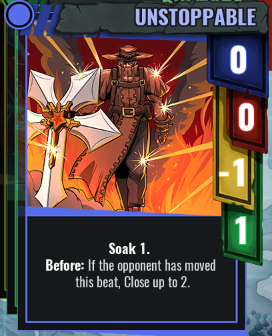 Ignore Soak: The opponent's Soak value is negated for this attack. Ignore Stun Guard: The opponent's Stun Guard value is negated for this attack. Characters that have Stun Immunity ignore this effect. Life: The player's vital resource. When a character's Life totals 0 or less, they are Eliminated. Life Loss: An effect that reduces a character's total Life. Life Loss does not stun, nor can it reduce a character's Life to 0. If a character's Life would go below 1, it instead remains at 1. Life Steal: An effect that causes Life Loss to an opponent, and causes an equal Gain in Life for the attacker. Lose: The loss of a bonus or resource. Also, the state in which a character's Life totals 0, where they are Eliminated. Marker: A non-character that occupies a space on the board. Characters can share spaces with markers. When a marker is told to "move anywhere," it may choose its own space to move to. Move: Depending on the context, it can act as a single Advance OR Retreat, or as a single Push OR Pull. Move Anywhere: Also known as Direct Movement. Remove your character from the board and place them in any other legal space, generally any space that does not have another character, and not the space you started from. Markers can be moved into occupied spaces or their own spaces. Move Past: To use an Advance to move one character past another. Move Up To: A movement effect that allows a character to move up to a certain maximum number of spaces, with 0 as the minimum. Movement Effect: Any Advances, Retreats, Pushes, and Pulls performed. Overload: One of three different Force Overload Tokens, each costing 2 Force to ante. 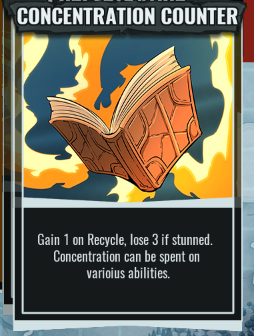 Overloads return to the player's Supply during Recycle. Passive Effect: Any effect that does not use an Ante, Reveal, Start, Before, Hit, Damage, After, End, or Recycle trigger. These are always active until the card they are printed on is out of play. Place: To put a Marker on the board. Markers must first be placed in order to be moved. If a marker is already on the board, it can be moved using the Place action. Power: The amount of potential Damage that an attack can deal. Priority: The speed of an attack. The player with the highest Priority during Reveal becomes the Active Player. Pull: To move an opponent towards your character using your attack. Push: To move an opponent away from your character using your attack. Range: A value on Attack Pairs that determines if an attack hits after Before effects are resolved during Attack Activation. Range is measured both forward and backward. Range X: Attacks with a Range of X count an opponent as "within Range" for the purposes of a Hit if the criteria is met. Reactive Player: The player with lower Priority during Reveal. The Reactive Player may not receive an Attack Activation if they become Stunned. Recover/Regain: Same as a Gain, but specifically for resources like Life and Tokens. Reveal: The step after Ante. Reveal effects activate immediately when this occurs. Afterwards, the Active Player is determined. Retreat: Movement away from an opponent. 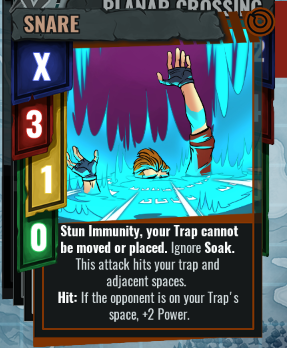 Soak: When hit, subtract Soak from the attack's Power to determine the Damage dealt. Spend: A loss of a resource, such as Life or tokens. When something is spent, it is discarded. You cannot spend what you do not have. Standup: A term for characters on the board. Start: The effects that occur before Attack Activations. Stun: When a character takes more Damage than they have Stun Guard. If a player is stunned, they lose their Attack Activation. Stun Guard: A defense against being stunned. Protects up to the amount of Stun Guard listed in Damage. 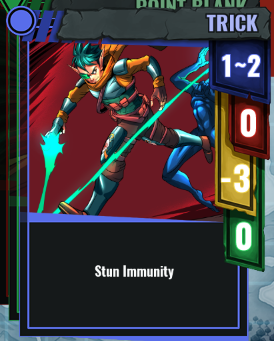 Stun Immunity: When a character is impervious to becoming stunned. Effects that automatically Stun or Ignore Stun Guard have no effect against Stun Immunity. Style: The left-most card of your Attack Pair. Modifies the Base. Switch is a card that all characters have that can be used as a Style in your Attack Pair, but it otherwise doesn't count as a Style for the purposes of card effects. Supply: A zone where all Tokens, Counters, and special Cards are held in reserve. Resources that leave you supply become Discarded. Switch Sides: When a character ends up behind their opponent, regardless of how it occured. A character can potentially Switch Sides without Moving Past their opponent, but a character that Moves Past an opponent always Switches Sides. Token: A resource that is spent during Ante to provide various benefits. Unique Ability: The character's special rules. All characters have one, ranging from complex resource management to simply having extra Styles or Bases. Unique Base: A character's seventh Base. Each character has one specific to them, usually interacting positively with their Unique Ability.